Nietzsche’s critique of modern schooling is balanced by his vision of an education of the future. Its basic aims are stated succinctly in one of his last books: ‘One must learn to see, one must learn to think, one must learn to speak and write’. In each case he has radical alternatives to the goals and methods of present-day education in mind. His reform of the school starts with teachers who are examples of culture. Despite this plan for a new kind of educator, Nietzsche speculates that, given the availability of many ways of learning, ‘the teacher in his usual form must become almost superfluous’. Mutual education amongst friends is one alternative, but so is individual self-education. This has its own pre-conditions: solitude, the courage to renounce certainties, and a commitment to ‘self-overcoming’. 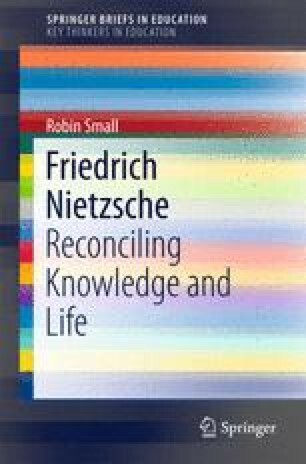 It implies a broader task of self-realisation for which Nietzsche has a cryptic formula: ‘Become what you are’.